Black Friday is over, but there are still a few deals hanging around until Cyber Monday. 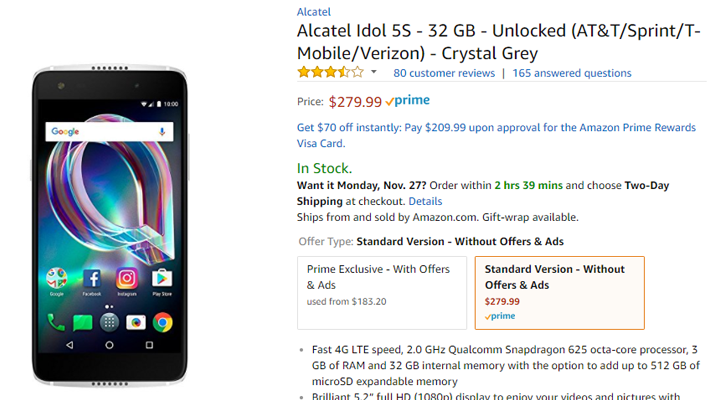 From now until November 27 at midnight PST (or until supplies run out), you can grab an Alcatel Idol 5S for $80 off, or an Alcatel A30 for $40 off. The Idol 5S is a mid-range device, with a Snapdragon 625 processor, 3GB of RAM, 32GB of expandable storage, and a 5.2" 1080p IPS display. The rear-facing camera is 12 MP with video stabilization, and the front-facing lens is 8 MP. Most reviews for the phone point to the design, speakers, and performance as excellent. However, many reviewers and buyers say the battery life is average at best. The A30 is very much a low-end phone. I'll be honest, the $60 price is probably what it should have been from the start. You're looking at a Snapdragon 210 processor, 2GB RAM, 32GB of expandable storage, and a 5" 720p screen. On the bright side, it has front-facing speakers and a headphone jack. The A30 is probably best suited as a backup device, especially since there are both GSM and CDMA models available (the CDMA model will not work on Sprint). You can get the Idol 5S and A30 from the source links below. To get the discount, you'll need to use the 40OFFA30 coupon code for the A30, and 80OFFIDOL5S for the Idol 5S.